Interested in hiking the Voyageur Trail, but you are not sure what to expect? Here are some answers to the most frequently asked questions. Looking for Hike leadership courses. Contact info@ voyageurtrail.ca or Hike Ontario directly on their website. The Voyageur Trail is a pedestrian trail only–this means that it is made for hiking, backpacking, snowshoeing and bushwhack skiing (registered with the Trans Canada Trail for only these uses). If the trail is on private land, the landowner has only been asked for permission for pedestrian uses only and we ask that you respect the landowner’s wishes at all times. In most places, the trail is too rough for other uses anyway. Where trees have fallen completely to the ground and lie there across our path, more frequently than not, we climb over it. We cross streams on beaver dams, rocks or logs. There are no facilities along the Voyageur Trail. This is why we advertise it as a “true wilderness trail”. No matter what kind of physical shape you are in, you can expect to do approximately two (2) kilometres an hour on the Voyageur Trail. Plan your outing taking this into account. Some hikers have described it as “bushwhacking with blazes”, and in some areas, this description is true. You can expect to see wildlife along our trail. In Northern Ontario, the largest animals you can see include moose, wolf and black bear. We ask that you respect all wildlife you may encounter. It is THEIR home and WE are the visitors! You would do well to remember that. If you plan on camping at any of the designated campsites, please hang all your food and anything which has a smell to it in a bear bag. This is a tree branch located a distance from your tent at least 10 feet off the ground. If a bear visits your campsite during the night, it will go after your bear bag and not your tent! Most animals are interested in smells of any kind. You would be wise to use deoderants, shampoos and soaps with no scents added to them. Bear sprays are made from pepper and are designed to work only if you spray the mixture right into the bear’s eyes. Do NOT try to use them as a repellent. If you spray anything with bear spray, it will attract bears, not repell them. They like to lick the pepper! Also, your bear spray can should be stowed with all the other things in your bear bag at night as it will attract them to your tent if they catch a whiff of the pepper in the can. Not only will these scents attract bears, but flies as well. June is usually the worst month of the year for black flies in the Northern Ontario bush and they usually begin around the long weekend in May. July is the favourite month for mosquitoes. Horse flies usually start in July. If you hike in the spring or fall to avoid fly season, be forewarned that spring runoff will swell streams and rivers until May. This may make crossings more difficult. Fall is a great time to hike, but remember that evenings are cold and daylight hours are short. Don’t get caught out after dark and it can get dark very fast in the fall! When the trail is cleaned, we make sure that blazes are in place and can been seen from a distance. This means that blazes are replaced and branches interfering with seeing those blazes are clipped back. That is our number one priority on a trail maintenance outing. Old blazes are painted on the tree, which can make them hard to find. Newer blazes are made out of scrap pieces of white vinyl siding. 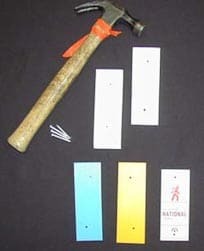 They are nailed to trees using aluminum nails so if the tree is ever harvasted in the future, the nails will slice through and won’t hurt anyone employed at a lumber mill. As you pass a blaze, you should be able to see the next one. Sometimes branches or downed trees can obscure blazes and it may take a while to pick up the trail again. We would appreciate hearing from anyone who finds this situation so trail maintenance crews can be sent out to remedy the situation. A double blaze indicates a sharp turn in the trail. White blazes indicate the main trail, blue indicate a side trail to a point of interest or an access, and yellow blazes indicate a loop trail. On rocky outcrops where there are few trees to blaze, we build cairns of rock to mark the route. Samples of various blazes you may see at an access point. White blazes indicate the main trail, blue blazes indicate a lookout trail, or access trail and yellow blazes indicate a loop trail. National trail blazes are found from time to time along the trail. On trail parties, we also try to clip small tree saplings on and near the trail to keep the forest from regenerating over our path, however, we do not bother with rapid annual growth such as raspberry canes, ferns, etc. When the tree canopy is cut back (for instance, when logging has taken place, or along road access points) the direct sunlight will encourage growth along the forest floor. Raspberry canes and ferns will grow back very quickly if they are clipped, which wastes a lot of time for a few people planning on cleaning a length of trail in any given day. The main focus is to keep people from getting off the trail (blazes) and keep trees from growing up in the middle of our path. The end result of all this to a hiker, is that in sections that are not well used, the “path” may be obliterated by ferns and other vegetation. If you do not see a “path” on the ground, follow the blazes very carefully. It is easy to get off the planned route if you are pushing your way through five foot high ferns! These two photos were taken before and after a trail maintenance outing on the same piece of trail. We usually re-route around large downfalls across the trail. Handtools are used on work parties. 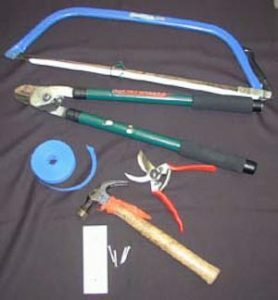 If you decided to go out on a trail maintenance outing with an organized club, you would be shown how to use these tools and would only use the tools you were comfortable handling. From Elliot Lake west to Sault Ste. Marie, the Voyageur Trail runs parallel, but approximately 6 to 8 kilometres north of the Trans Canada Highway. The only town the trail runs directly through (for reprovisions) is Iron Bridge. The rest of the time, you must travel 6 to 8 kilometres south along various access roads to reach towns where reprovisioning can take place. This section is inland from Lake Huron. It is rugged with hills, streams, rivers and inland lakes (see photo). In all areas of the trail we recommend a water filter, but in this section in particular as the only available water would come from beaver streams. You can look forward to much peace and quiet. The overlooks are usually over inland lakes and rivers, or vast tracts of trees. It is not well-used therefore has a tendency to be overgrown in most spots. The stretch between Elliot Lake and Blind River is 23.5 kilometres long with no access points in between. This means at least one overnight to travel this section. You should obtain permission from the Band Office if you plan on travelling through the Echo Ridges section through the Garden River Reserve, just east of Sault Ste. Marie. In the immediate Sault Ste. Marie area, the trails are better used and cleaned, therefore, a little easier to follow. There are numerous access points allowing hikes from one to several hours long. 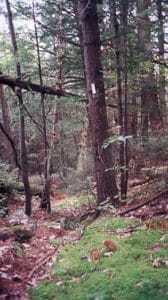 There are two loop trails in the Sault Ste. Marie area (yellow blazes) in the Gros Cap area (highest hills in the Saulteaux section), and the Hiawatha Highlands area. There is a 16.5 kilometre long blue side trail called the Tom Allinson Spur Trail which takes you from the hills at Gros Cap to the shoreline of Lake Superior. The Saulteaux Club is the largest Voyageur Trail Club and plans numerous outings on the Voyageur Trail in all seasons. You are welcome to join their outings for an introduction to what you can expect on the Voyageur Trail. Superior coastline, there are some spectacular views from the top of King Mountain and Robertson Cliffs. Stokely Creek Lodge (a world class cross country ski resort) operates in the area and has many ski trails crossing the Voyageur Trail. Be careful to watch your blazes to stay on the trail. The Harmony Section offers a beautiful lookout over the Haviland Bay arm of Lake Superior, as well as, many inland lakes, rivers and streams. (Wonderful “Lake Superior” swimming opportunities at Harmony Beach and Havilland Bay.) The Canadian Forest Service Centennial Loop trail is between this section and the Stokely Section. 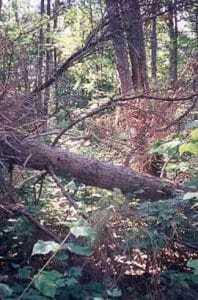 Again, the trails are not widely used and may be overgrown. Be careful! The Lake Superior Provincial Park Coastal Trail is aptly named. It follows the coastline of Lake Superior and that means rocks! Big rocks, medium rocks, little rocks and some find sand beaches usually at the mouth of rivers. Rocks can be treacherous when wet. Keep this in mind. A simple turned ankle can endanger your life while you wait for someone to come along to rescue you. You are right on the shoreline of Lake Superior with all of its many moods. Crashing waves, fog and wind are sometimes the order of the day, but you are rewarded with fine (but usually cold) swimming and an endless supply of water! There are park fees for hiking the coastal trail. The Michipicoten Section near Wawa has some beautiful overlooks (see photo to left) and waterfalls, however, it is not well-used and may be overgrown at times. Again, remember, they who go up must come down! If we tell you there are beautiful overlooks, this means climbing is on your agenda. The Coastal Trail in Pukaskwa National Park is a beautiful, well-used backpacking trail. There is only one entrance, at the northern tip (Hattie Cove) and you must register with the Park staff before using the Coastal Trail. This is for your own good, as if you don’t return at the reported time, the park will launch emergency personnel to find you. It is a good introduction to Northern Ontario hiking because of this registry system. It takes approximately 7 days of hiking to reach the southern tip of the Coastal trail and then you have to get back! We have had reports that the Marathon section of the Voyageur Trail system is in poor repair. We haven’t had a club there and without people to look after a trail, the forest reclaims it pretty quickly. It follows the coastline of Lake Superior in the town of Marathon itself and heads west to a loop trail which takes you to an overlook. The smooth shoreline rocks on this trail are treacherous when wet. The Casques Isles section of Voyageur Trail near the towns of Schreiber, Terrace Bay and Rossport is 52.4 kilometres of high cliffs affording spectacular lookouts, beaches on Lake Superior and inland scenes. It is rugged but worth the effort. It also passes through Rainbow Falls Provincial Park. The Casques Isles Voyageur Trail Club offers many outings during the year that you would be welcome to participate in. The most westerly section of Voyageur Trail at the moment is the Nipigon River Recreational Trail between the towns of Red Rock and Nipigon. This 8.2 kilometre section is rugged with climbs to spectacular lookouts over Nipigon Bay. You may wish to visit the individual trail section site pages to see more photos in their photo galleries of the types of terrain you may see on any given piece of Voyageur Trail. In summary, the Voyageur Trail offers something for everyone. From inland, peaceful lakes and rolling hills to the breathtaking cliffs of the western sections. It is not recommended to hike alone on ANY section of the Voyageur Trail. Always let someone responsible know where you are going, your route and your expected time of return. Carry enough to ensure that you can survive at least one night in the bush if the fates turn against you. A Voyageur Trail Guidebook is a must and we recommend topographical maps and a compass as well. In many sections of the trail, a cell phone will not work as there is no coverage. Do not rely on this as your emergency equipment! Be aware of hunting seasons and dress in bright colours to not only be seen easily by hunters but by rescuers should you become lost. Be aware that three of anything is a call for help–three whistles, three fires, etc. Northern Ontario bush demands respect. The Voyageur Trail is a primitive, wildland trail in rugged country. For the most part, there is little trail traffic, and no nearby facilities, therefore you must be self-sufficient! It is the safe hiker who is the good hiker. Visit the Trail Conditions section on each web page (sorted by location on this website) to find out when the last time your intended route was cleaned, and please report back to us after your trip so we can better plan our trail maintenances. For a list of businesses who supply the Voyageur Trail Guidebook, consult our Membership and Store link. From the Voyageur Trail Association, happy hiking!